President John Mahama has inaugurated a GH₵50 million tomato-processing factory at Tema that will serve the local market and also feed neighboring West and Central African countries. The magnificent state-of-the-art facility has a generating capacity of 30,000 metric tons per annum. The facility forms part of a five-year investment plan worth GH₵100 million by Conserveria Africana Ghana Limited, the company behind the importation of tomato paste brands such as GINO and POMO. According the company is one of the landmarks in fulfilling his state of the nation address delivered last year where he mentioned over reliance on imports of goods from abroad as the major problem confronting the Ghanaian economy. The government believes that this factory is going to boost the attainment of our agenda for transforming the Ghanaian economy into an export led economy. It will also reduce the amount of foreign exchange that we spend each year on items that we have comparative advantage to produce in Ghana. 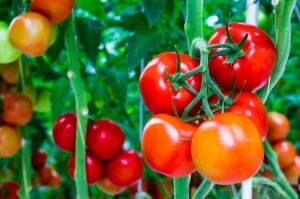 The model adopted by Conserveria Africana Ghana Limited to set up a packaging plant in Ghana will go a long way to reduce the importation of tomato paste in the country stands to save US$100 million per annum. With the factory now on stream, GINO and POMO, their leading brands in over 24 countries in West and Central Africa, would be produced locally. Reduced rice, poultry, fish imports, etc: There has been some remarkable progress in cutting down the rate of goods imported into Ghana. For instance, local rice production has seen an increase by almost 60% whereas investment in poultry production and aquaculture have also gone up. Investments aquaculture: With the investment that made in aquaculture, we have seen an increase from 5,000 tons to 30,000 and our intention is to increase it to a 100,000 tones by the year 2020. Past investments in the agribusiness sector are finally beginning to show positive results. However due to the low maturation of this sector in Ghana, there is still a lot of room for growth and potential development. I will rate investment risks in this sector in Ghana as moderate. Time permitting, I will prepare a sector analysis replete with risk profile before the end of the year to share with the investment community.